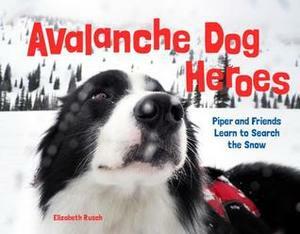 Follow Piper the border collie and her canine classmates through a season of avalanche rescue training. As they learn the skills they need to become snow rescue dogs, you'll learn about the work these amazing canines do and about avalanche safety. Avalanche Dog Heroes in Training is a nonfiction picture book illustrated with stunning, adorable photography that draws parallels between kids' experiences in elementary school and the training days of the avalanche rescue dogs of Crystal Mountain, Washington State's largest ski resort, located in the Cascade Range. Follow along with Piper, a friendly border collie who came to the mountain as a smart but timid shelter dog, terrified by everything, as she confidently heads off to school on a chairlift to meet her canine classmates. Over a season they romp together through the snow, learning and practicing the skills they need to be avalanche rescue dogs and earn their rescue certification. You'll also learn the warning signs and conditions that cause an avalanche, the four types of avalanches, and the basics of avalanche safety.